Someone asked me if I’d always “been into” food. I thought, “Not really…” and began reviewing my youthful ambitions: Ballerina. Disney Imagineer. Christian martyr. Age 2: Buying powdered doughnuts at the drive-through convenience store in Miami. Age 3: Sitting in the yard with my cousins, wearing a ratty t-shirt reserved for the stains from impossibly juicy mangos. Instead of mud pies, my grandmother and I made mud tamales. Age 4: Tea time with my mother at 3:00pm, prompt: white toast with butter and guava jelly as the sun set in a blaze of orange. Tea time in Buenos Aires: white sliced bread, butter spread evenly to crust-less edges, cut into quarters. Age 5: Realizing that not everyone had enough to eat. The supermarket in Granada was mostly dusty shelves. Encountering rice pilaf as an individual course in Mexico—and hating it. Age 6: Experiencing fancy food: Guanábana bombe for a fancy dinner party, courtesy of my grandmother. Profiteroles bathed in warm chocolate sauce at a white tablecloth restaurant in Mexico City. Getting sick after eating marzipan grapes at a First Communion party. Discovering consommé. Age 7: Eating birthday cake with Jell-o. Apparently a common occurrence at Mexican birthday parties. Feeling grown-up because I loved pistachio ice cream. Age 8: Eating my first TV dinner—I just had to try that cherry cobbler. Age 9: Reading the Anne of Green Gables and Little House on the Prairie series, mesmerized by the descriptions of food preparations. The Hobbit falls into this category as well. Age 15: Reading Jeffrey Steingarten’s article about Roman pizza bianca, then devouring a 12-inch rectangle of said item at the forno in Campo dei Fiori. It was better than I’d dared to imagine. Age 16: Discovering Roman peaches. I can still smell them. Age 28: I don’t think I’d ever really enjoyed lobster until I had it cooked in briny ocean water in Cape Cod. When I eat or cook it’s hard to stay in the present and not travel back in time. The smell, the taste, the touch—déjà vu and comfort. As if that title really needed a question mark. Lately, I’ve grown rather fond of starting my weekends on Thursdays. A cocktail with friends or dinner al fresco is the perfect way to start undoing that painful knot that steadily builds up under my right shoulder blade during the week. This summer, I’ve rediscovered sangría. The concept of sangría has always appealed to me: it’s fruity, refreshing, and, well, it’s got booze. But for the most part, what’s poured at restaurants is watered down and tasteless. I’ve made a few modifications. ¡Salud! Rather than diluting sangría with regular ice, I like to add tropical fruit ice cubes. I love Goya varieties, like guava and passion fruit, but orange juice, white grape juice, or tropical punch are acceptable substitutes. – Shake juice cans well. Pour into 2 12-cube ice trays and freeze. – In a large pitcher, combine wine, orange juice, triple sec, and fruit. Stir in club soda and ice cubes right before serving. Yes, dear readers, I have forsaken you. Few and far between though you are, I have left you hanging. The truth is, I’ve been in a rut. I’ve been cranky, tired, and every other day or so, having mini-breakdowns over this, my latest career move. My brain shorts out, my palms get sweaty, and I go into panic-attack mode. What possessed me to leave my – in the eyes of many, enviable, I should note – job and take out an absurdly large loan to become a cook? A COOK? I have no answer for this. Maybe I got a hunger pang and mistook it for a gut feeling. Next time you get a gut feeling, please, have a sandwich or a Snickers and rethink whatever it is you were convinced about doing. Decisions are made much more rationally on a full stomach. Despite everything, however, I continue to cook. On Saturday I made gnocchi (from scratch!) with brown butter, sage, and toasted hazelnuts. 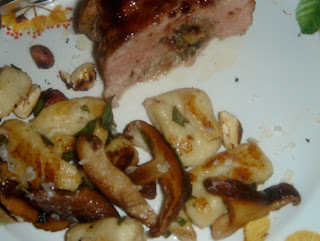 Also, pork tenderloin stuffed with wine-poached pears and cranberries, bacon, and mushrooms with a plum glaze. And on Sunday I made strawberry cornmeal muffins. I have a 10-year-old brother who owns a guinea pig named Diego. I met Diego for the first time a month or so ago when I went to visit and it was an interesting encounter. I saw Diego peek out from the little plastic castle in which he spends most of his time and I cooed, “Ohhh, how cute.” I was overcome with warm, fuzzy feelings. And just as I was experiencing these pleasant emotions, Diego crept out of his cage. He was a little bit like a bunny. And a lot like a rat. Remember Wuzzles? They were these cartoon animals that were two animals in one…like Eleroo (elephant / kangaroo)… So I guess a guinea pig would be like a burat (bunny/rat) or a runny (rat/bunny)… Even now when I think about it I’m confused. Do I love Diego and his kind? Are they meant to be cuddly pets or pests that should be exterminated? In any case, the more relevant question to this discussion is: SHOULD GUINEA PIGS BE EATEN? My little brother was appalled when I told him some cultures are rather fond of guinea pigs – as food.